Born of humble circumstances the Revelation is a domesticated dreadnought. Unlike other dreadnoughts in its genius, Revelation's were breed up from Abaddons, one of the original domesticated Battleships. This selective breeding program produced a remarkable strong, efficent dreadnought. A solid crystal users, Revelations where the backbone of the Amarr Empire for centuries. Fleets would load up on crystals and fight for weeks on the front lines grinding through entire solar systems without rest. Their brass-gold coloring provides excellent camouflage inside of the Amarr nebula. Unlike the other three known families of dreadnoughts, Revelations are not prone to migration and they do not always seek deepsace. 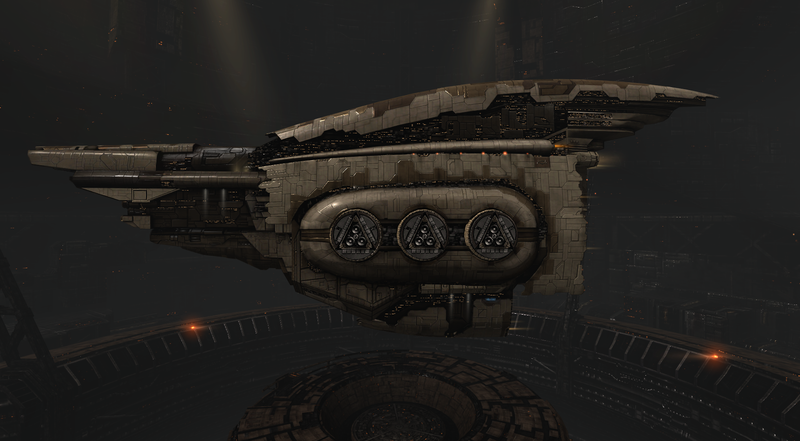 One is even still stabled in Amarr and is a favorite of both the local residents and tourists alike. She is tame enough to work asteroid fields and show that even the mightiest of the Amarrian Fleet can do the humblest duties at the empires need. Their great size and imposingly cuspated exoskeleton make them hard to house. Due to their docile nature they do not mind tight quarters and will rest inside of a hangar regularly. However, they are not often taken out for exercise as are other ships that are stabled with them. Despite this, they have a ponderous elegance on the field that is instantly recognizable. Some may consider them simple due to their well known abilities and solid temperament. Still, on the field they are true warriors and stand up to tremendous amounts of damage without flinching. It is said that few things bring a tear to the eye(1) of a Revelation handler then seeing their beloved dreadnought in dry dock battered and scarred from battle. The Revelation is an affection battleship. They thrive under the care of their handlers and will happily chew through structures for hours. They are known to be terribly fond of grooming and will rest under station buffers until their hulls shine. 1 - The tear is assumed due to documented sounds resembling sniffling and hands vanishing into the deep, cowled hood of the handlers. Since few Amarr pilots appear to go unhooded, direct conformation does not yet exist. However, this author feels that the supporting evidence is such to allow for the documentation of this. Khanid pilots, for one, do not cry. Patriotic fervour and pride merely condenses to liquid form and escapes from the body at the eye. The sniffing is merely a by-product of the exertion it takes to manufacture this liquid.